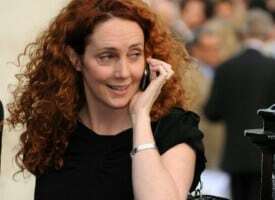 The mooted return of Rebekah Brooks to head Rupert Murdoch’s British print empire – which now includes The Times, the Sunday Times, the Sun, various book publishing interests and the Sun on Sunday (successor to Brooks’ former fiefdom the News of the World) – is interesting. Brooks (left) has been acquitted of a number of phone hacking charges, unlike many of her colleagues including former NoW editor and Number 10 press spokesman Andy Coulson, currently residing at Her Majesty’s Pleasure. Such controversial appointments are usually leaked in advance to see what the reaction is. In this case it was predictably hostile but Murdoch and co. would have expected that. What surprised everybody was that the Metropolitan Police in London announced last week that it had sent a further hefty file on phone hacking and various other supposed misdemeanors to the UK’s director of public prosecutions. This means that the Met, previously under fire for its cosy relations with the NoW, thinks further prosecutions might be in order. So it’s not really over until it’s over. Whether or not all this affects Brooks’ return to the fold is anyone’s guess. The main reason for her, arguably, surprising return seems to be the flagging fortunes of the Sun and the Sun on Sunday under current News Corp UK CEO Mike Darcey. Darcey has followed a strict paywall policy that doesn’t seem to have worked, although it does seem to have enjoyed some success at the more upscale Times and Sunday Times. The Sun has faltered in comparison to rivals Mail Online and the Mail on Sunday and the FT reports that revenues at the tabloid titles are down from £654m in 2011 (when the NoW closed) to £490m. Sun editor David Dinsmore is rumoured to be moving upstairs with former Daily Telegraph editor Tony Gallagher, currently deputy at the Daily Mail, due to be parachuted in. Neither his arrival or that of Brooks seems to be quite a done deal yet. Mail owner Associated may try to persuade long-serving Mail editor Paul Dacre to step down and concentrate on his group responsibilities so it can keep Gallagher. The odds are, though, that Brooks is on the way back – which should make what we used to know as Fleet Street a livelier place. Rupert Murdoch has always wanted her back and, with his tabloid papers feeling the pinch, he now has a pretty compelling commercial justification to do so.